Ski-Doo Stator GTX 500SS, Sport 2005-2008 Snowmobile PWC 44-10925 OEM# 410922946, 410922965, 41092294693, 420889905 by Pwc Engine at Chosen Hubs. MPN: PWC 44-10925 E. Hurry! Limited time offer. Offer valid only while supplies last. This Ski-Doo Stator will fit all models GTX 500SS, Sport 2005-2008 Snowmobile PWC 44-10925 OEM# 410922946, 410922965, 41092294693, 420889905. This Ski-Doo Stator will fit all models GTX 500SS, Sport 2005-2008 Snowmobile PWC 44-10925 OEM# 410922946, 410922965, 41092294693, 420889905. All electrical parts cannot be returned or refunded once our packaging is opened. If the part is opened and claimed to be defective, the part must be sent to us for testing by the manufacturer. If the part is claimed to be good, then you will be charged 20% restocking fee. Be sure of your application and check all OE Manufacturer part numbers provided if any. If you are having any doubts in application for the item you need, please contact us with your Year/Make/Model for the application and we will provide you with a link to the correct item if it is available for your machine.We can help you with avoiding an unnecessary return. All electrical items must be returned within 14 business days from date of shipment from us. After this date we will not refund. At Pwc Engine com we offer aftermarket parts for top name brands. * We use parts from WSM, Pro-X, & Wiseco pistons, OEM RIK Japan rings, Nachi, Koyo, & KBC Engine bearings. PWC Engine use the highest quality gaskets and seals in the industry such as Athena USA, factory used ARS precision quality seals when available and much much more. .
High Performace Quality OEM Style Snowmobile Stators. 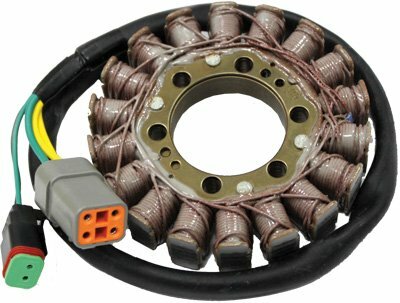 Snowmobile Stators meets OEM standards or higher.